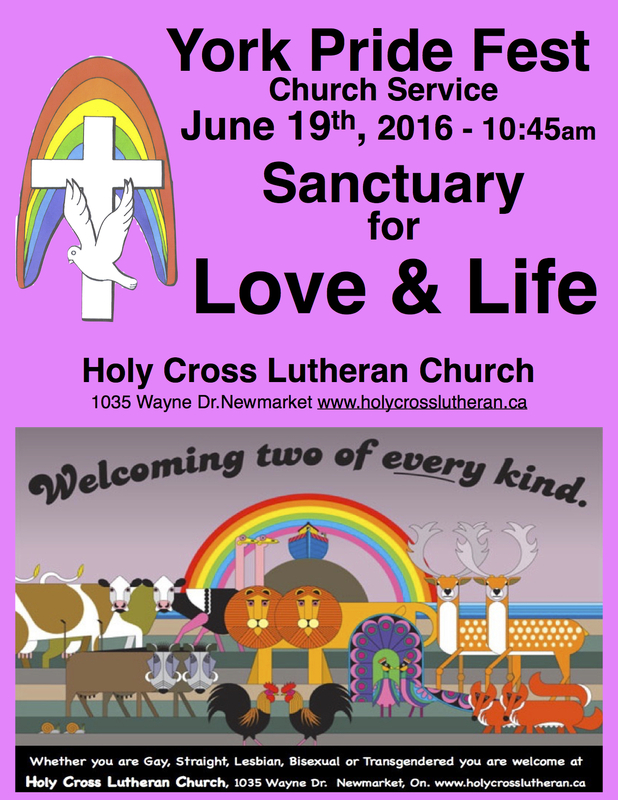 In the wake of Orlando, we at Holy Cross have the honour of hosting this year’s York Region Pride Fest Worship. As we struggle to find ways to respond to this horrific tragedy, the word “sanctuary” keeps me grounded. While the word sanctuary has its origins in the word for holy and was used to designate a sacred place for worship. As a result of the tradition of sanctuaries providing safe harbour for fugitives of all kinds, the word has come to mean safe haven or place of safety. “Sanctuary” how sadly appropriate for those of us seeking safe haven from the harsh realities so often inspired by perversions masquerading as religion that we shall shall gather together to create a sacred space of sanctuary, in the words of our hymn for the day, “For All the Children.” As I prepare to create sanctuary for others, I keep listening to this rendition which creates sanctuary in me. Shalom…. This entry was posted in HOLY CROSS LUTHERAN, Progressive Theology, Theology and tagged Holy Cross Lutheran Church Newmarket, LGBTQI worship Newmarket, Orlando worship, PFLAG York Region, York Pride Fest 2016 by Rev. Dawn Hutchings. Bookmark the permalink.